With less than one week to go for the 2015 Presidential Election, the Centre for Monitoring Election Violence (CMEV) officially launched #IVotedSL, a trilingual campaign to encourage citizens to exercise their right to franchise. We’ve also created banners Editors of news media and bloggers can choose feature on their websites, in print or via television. 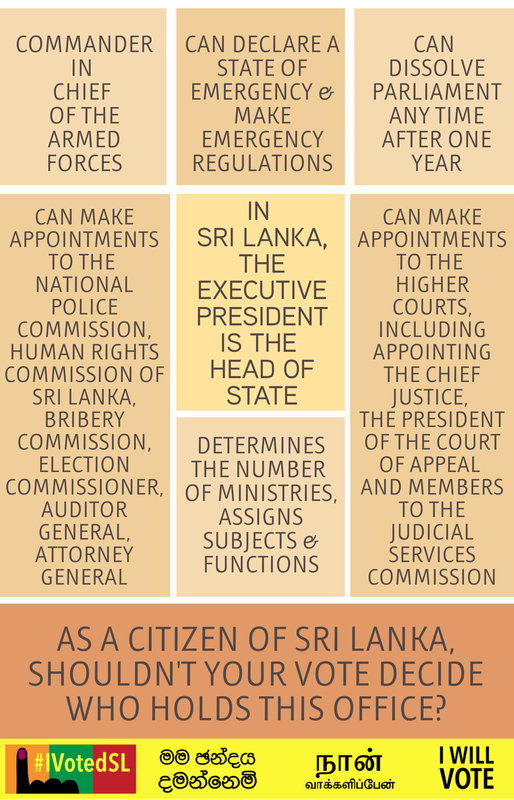 All images are copyright free and available in Tamil, Sinhala and English variants. Download them all from http://bit.ly/ivotedsl. Over the new week, the #IVotedSL campaign will disseminate infographics on the importance of voting and encourages the general public to also share photos, memes and other media content depicting the importance of voting using the hashtag #IVotedSL. Our first infographic in this regard is below. CMEV does not support and or endorse any candidate or political party. #IVotedSL is meant to get citizens animated around the importance of exercising their vote. It is emphatically not aimed at the promotion or criticism of any particular candidate.